Passenger rail service through this canyon began in 1913 as the Oakland, Antioch and Eastern Railway. In 1928 this line became part of the Sacramento Northern Railway which provided passenger and freight service. In 1939, when the Bay Bridge was built, the Sacramento Northern ran on the lower deck of the bridge. 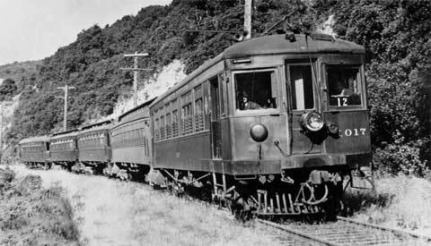 It was one of the longest electric interurban lines in the United States at 185 miles from San Francisco to Chico. The route of the Sacramento Northern started from the current Transbay Terminal on Howard St in downtown San Francisco. Trains then looped onto the lower deck of the Bay Bridge. The lower deck of the Bay Bridge had two tracks that were shared by the Sacramento Northern and Key Route System. As trains came off the bridge, they headed straight into Emervyille and up to 40th & Shafter Ave. 40th & Shafter was the location of the SN's car barn and maintenance shop. 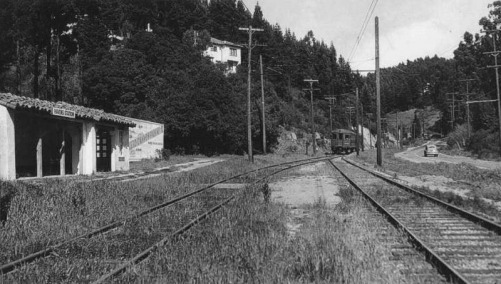 A single mainline track then headed north on Shafter Ave, crossing College Ave and then looping above what is now Hwy 24 to start it's climb into the hills. The line then headed southeast at the end of Chabot Rd, and skirted the eastern side of Lake Temescal. It followed the western side of Highway 13 until it crossed over at the Thornhill/Moraga avenue intersection. You'll note the newly created "Short Line Pocket Park" which marks where the SN crossed Thornhill/Moraga. The railway continued on behind the 1927 Montclair Firehouse and crossed behind the school and over Mountain Blvd. The massive concrete abutments on Mountain Blvd were the abutments for the steel trestle that crossed here. The rails continued on behind the village of Montclair and crossed Snake Rd on another trestle. It continued on to the area known as "Melin Cut". The line makes a sharp turn here on its way to the canyon. From here on the line is relatively straight and the grade is easy. The Havens station was located at the northwest corner of Paso Robles and what is now Bishops Ct. The line continues on to the tunnel at Saroni Dr. It comes out of the tunnel on the east side in the town of Canyon on Pinehurst where it parallels Pinehurst all the way to Canyon Rd where it turns west and into Moraga, Lafayette, Walnut Creek, Concord and Pittsburg. At Pittsburg trains were loaded on a ferry to cross the Suisun Bay and then continue on to Sacramento and beyond. The most picturesque section was from Lake Temescal, through the Shepherd Canyon and on to Canyon. At the eastern end of Shepherd Canyon, near Saroni Drive, the train passed through a tunnel 3200 feet long and emerged in the tiny wooded hamlet of Canyon. The sheltered redwood groves were reminiscent of the mighty forests that once covered the Bay Area. Picnickers and hikers could disembark and cool themselves in the shade by the creek or ride on through orchards, meadows, and majestic oaks to the towns of Moraga and Walnut Creek. Travelers bound for Sacramento and beyond would ride on the only interurban ferry in the world that carried the entire train across the Suisun Bay. There were two major obstacles for building a rail line through the Shepherd Canyon. A large hill (mostly rock) in the path of the right-a-way at the start of the canyon and of course the Oakland hills themselves. An immense cut was made in the rock hill at what was know as "Melin Cut". This cut is located at the large sweeping turn as the right-of-way travels from the Montclair area into the Canyon (above the city's Corporate yards). This cut was built using mules, dynamite, and hand picks. 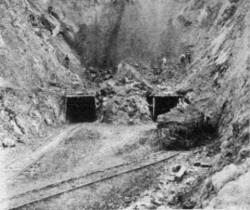 On August 16th, 1911, work began on the 3200 foot tunnel often referred to as the Redwood Canyon tunnel. The portal of this tunnel is located just a few feet west from the edge of Saroni Drive at Shepherd Canyon. As you walk along the trail here, you'll notice the houses getting lower and lower as the right-of-way descended and approached the tunnel portal. The tunnel was built with a mixture of 12x12 redwood beams and concrete lining depending upon the geology of the area. Water and mud were said to be a constant construction hazard. On Feburary 14, 1913, the first train passed through the completed Redwood Canyon tunnel. As with many passenger trains, the end of the line came swiftly with a double whammy of the Great Depression and the increased popularity of the automobile. Rail service of this type was considered to be an “old-fashioned” means of transportation. Also, the residents of Shafter Ave. complained incessantly about the noise and hazards of trains running right down the middle of their street day and night. 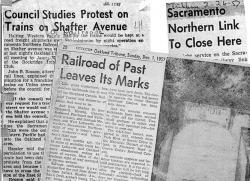 The last Sacramento Northern passenger train ran in 1941. Freight service however survived another 16 years until 1957 when this section of the railway ceased operations. The remains of the system disappeared almost overnight as salvage operators took the rails, ties, trestles, buildings, and even the ballast. The tunnel portals were sealed off with huge concrete bulkheads. Both ends of the tunnel are still there, but no longer visible due to landslides over the years. The abandoned right-of-way was purchased by the East Bay Regional Park District and leased to the city of Oakland. The ride from the Rockridge station to San Francisco’s Transbay Terminal was just 24 minutes. As a comparison, today's BART system takes 21 minutes for the same distance. The salvage operators worked meticulously to remove the remains of this once great railway. Aside from the concrete abuttments in the Montclair Village, you'd be hard pressed to find any other physical traces of the rail line. However, we're lucky to have a place to see, ride and explore relics of the old Sacramento Northern Railway. The Western Railway Museum in Rio Vista is a treasure trove of trains you can still ride on over the actual restored main line of the Sacramento Northern Railway. You can also explore 2400 square feet of rolling stock including cars that traveled on the SN, Key Route System, MUNI, and other Bay Area rail lines. Check out their website for more information.